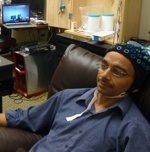 Apparently students at the University of Washington have successfully created an interface that allows one person to give mental commands to another. It's nowhere near as insidious as it sounds, despite superficial similarities to Orbital Mind Control Lasers found in the Illuminati card game. The long and the short of it (according to this Verge article) is that one person was watching the live feed of a simple video game but didn't have the controls to said game. He would think about tapping the spacebar to input commands, those thoughts would be transmitted across campus, and would finally be interpreted by someone else's brain such that that other person would fulfil the commands successfuly, without ever seeing the video game in question! Pretty awesome, right?